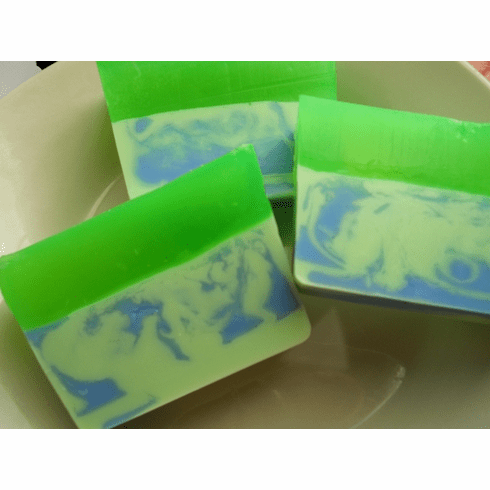 This soothing and refreshing soap smells as relaxing as it look. The perfect combination of eucalyptus essential oil and mint makes for a beautifully unique and tranquil scent. Soap weighs approximately 5.5 oz. The fragrance in this soap is a unique house blend. All of our ingredients are natural and of the purest grade. Our gentle soap is free of harsh chemicals and detergents. The number one ingredient in our soap is glycerin! Active Ingredients: Glycerin, Olive Oil, Grapeseed Oil, Eucalyptus Essential Oil & Leaves.